Click the button below to add the XL Communication POSTERS to your wish list. Our XL (Extra Large) LARGE size communication posters measure 24 x 36 inches and are designed to be used with a laser pointer. AlphaCore Core vocabulary boards arranged in alphabetical order. Created by Amy Roman, SLP of the Forbes-Norris ALS Clinic. Needs Words are arranged by type of word. ( For example, "Question" words are grouped together (Who, What Where, When, Why) action words are grouped together, etc. The Needs board contains core vocabulary as well as "needs" related words. Why Use a Core Vocabulary Board? The words on these boards are core vocabulary words. Core vocabulary words are the most frequently words used words in the English language (little words like "the" "she" "want", etc.) Core vocabulary words make up about 80% of our day to day converstation. 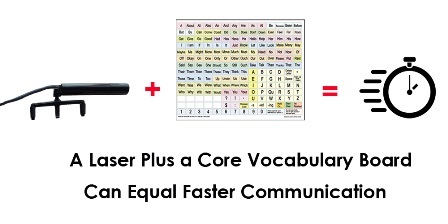 Using core vocabulary words can significantly speed up communication. It allows a person to construct a large part of their message word by word, rather than having to spell out everything letter by letter.